Facebook government requests: Report tracks global requests on user data after NSA spy scandal. 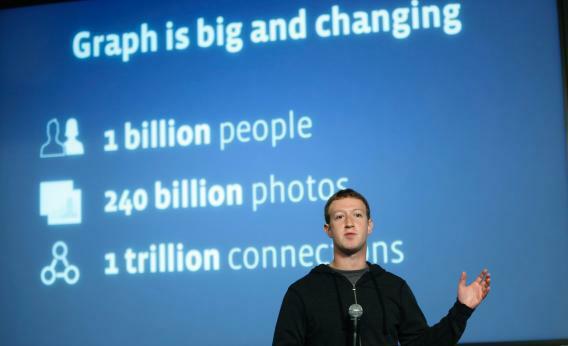 Facebook CEO Mark Zuckerberg introduces Graph Search features during a presentation on Jan. 15, 2013, in Menlo Park, Calif.
Facebook has finally caved. Amid spiralling concerns about government surveillance, the social networking company has at last revealed the extent of the requests for user data that it receives—belatedly following in the footsteps of Google, Twitter, and Microsoft. In a report released by Facebook on Tuesday, the company outlined the number of times it has been asked to turn over information on users by government agencies from across the world. Some 25,607 requests were received by the company for data on 37,954 separate accounts in the first half of 2013. Between 11,000 and 12,000 of the requests—affecting at least 20,000 users—came from authorities based in the United States, and some data was produced in 79 percent of cases involving U.S. demands. The second-highest number of demands for information on Facebook users came from India (3,245), followed by the United Kingdom (1,975) and Germany (1,886). Facebook says that it did not comply with all of the requests. Like other major Internet companies, Facebook is still being prevented from disclosing the specific number of requests it receives from U.S. authorities due to the extreme secrecy surrounding so-called national security letters and foreign intelligence orders. However, it is still possible to identify that Facebook—like Twitter and Google—receives far more orders to turn over user data from the U.S. than from any other country. One explanation for this may be that these companies generally have a higher percentage of American users, which is inevitably reflected in the number of requests received. Facebook says that the “vast majority” of the requests relate to criminal cases, such as robberies or kidnappings. The user data Facebook retains and can hand over in response to a government request includes basic subscriber information, such as a user’s name and how long he or she has been signed up to the service. The company can also provide authorities with IP address logs and content from users’ Facebook activity, presumably including instant message chats and other communications sent on the website. Releasing a transparency report of this kind is quite a big step for Mark Zuckerberg and company, as they have previously shown little enthusiasm for the idea. Back in May, Facebook’s public policy manager questioned whether such reports were “the most useful way to highlight” censorship and surveillance during a discussion at an Internet freedom conference in Stockholm.